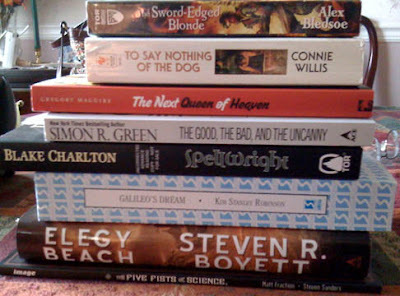 Behold my new pile of stuff, which is a mixture of purchases and recently received review copies. This will also serve as a sort of preview of what I expect to review at least partially over the coming months. At the bottom of the stack we have the graphic novel The Five Fists of Science by Matt Fraction that I bought during Tor.com's recent Steampunk sale. Fraction wrote Thor: Ages of Thunder, which is just about the best treatment of Norse mythology Marvel has done, so I had to give his take on Steampunk a try. Plus its got Mark Twain and Nikola Tesla as main characters. This will be read very shortly. Next we have Elegy Beach by Steven R. Boyett, which is the sequel to cult classic Ariel. I just read Ariel so expect a review of sorts shortly. Though I may wait until I read Elegy and do a combined review. I received both as review copies. Thirty years ago the lights went out, the airplanes fell, the cars went still, the cities all went dark. The laws humanity had always known were replaced by new laws that could only be called magic. The world has changed forever. Or has it? In a small community on the California coast are Fred Garey and his friend Yan, both born after the Change. Yan dreams of doing something so big his name will live on forever. He thinks he's found it-a way to reverse the Change. But Fred fears the repercussions of such drastic, irreversible steps. Spellwright by Blake Charlton is ramping up to be one of the most anticipated Fantasy debuts of 2010. I'm trying to hold-off reading until next year, but my curiosity may get the best of me. It doesn't release until February, but Tor was kind enough to send a review copy. The Good, The Bad, and The Uncanny by Simon R. Green is the 10th book in Nightside series. I plan on catching up on the series shortly along with the mass market release of Just Another Judgement Day. This was received gratis as well. Things were going so well for P.I. John Taylor, that it was only a matter of time before everything hit the fan. Walker, the powerful, ever-present, never to-be-trusted agent who runs the Nightside on behalf of The Authorities, is dying. And he wants John to be his successor-a job that comes with more baggage, and more enemies, than anyone can possibly imagine. The Next Queen of Heaven by Gregory Maguire of Wicked fame. Maguire has entered into a charity venture with Concord Free Press. Concord gives all of the books they publish away for free on a first-come, first-served basis, but they expect a donation to be made to a charity of your choice and the book to be passed on after reading. I was lucky enough to be among the 2,500 people to receive a copy. In a flyspeck upstate NY town at the end of the second millennium, something dangerous is coming—either Y2K, salvation, or murder. Following an accident in a church basement, a fundamentalist family is knocked off its fundaments while the choir director in the Catholic church next door schemes to escape both his sorry past and his sorrier future. Next is To Say Nothing of the Dog by Connie Willis, which I picked up used after the recommendation from my friend Jason. Sounds like a fun Fantasy/Sci-Fi mix and I've been meaning to read a Willis book for awhile. In her first full-length novel since her critically acclaimed Doomsday Book Connie Willis, winner of multiple Hugo and Nebula Awards, once again visits the unpredictable world of time travel. But this time the result is a joyous journey into a past and future of comic mishaps and historical cross-purposes, in which the power of human love can still make all the difference. The Sword-Edged Blonde by Alex Bledsoe has been on my radar since Jeff over at Fantasy News gave it a great review. A mix of Detective/Swords & Sorcery certainly sounds like it would be a fun read and the sequel Burn Me Deadly is due out shortly. I'll probably read and review this in the coming weeks. It should have been a case like any other: a missing princess, a king willing to pay in gold for her return. But before he realizes it, sword jockey Eddie LaCrosse is swept up in a web of mystery and deceit involving a brutally murdered royal heir, a queen accused of an unspeakable crime, and the tragic past he thought he’d left behind.